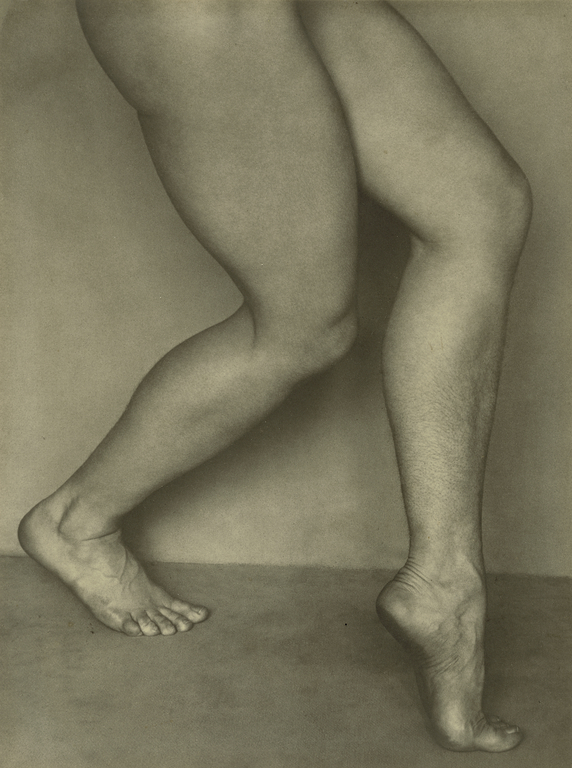 (Recto, mount) signed and dated in pencil, at lower right corner: "Edward Weston / 1927"
After seeing an exhibition of his photographs at the University of California at Los Angeles, the dancer Bertha Wardell volunteered to model for Edward Weston. She soon became a friend and lover, modeling for him in the spring of 1927 at his Glendale studio. Weston particularly admired her dancer's combination of strength and grace, writing that "her beauty in movement is an exquisite sight." Conger, Amy. "Edward Weston's Early Photography, 1903-1926." Ph.D. diss. (University of New Mexico, 1982), fig. 537/1927, titled: "Bertha, Glendale". Weaver, Mike, ed. The Art of Photography, 1839-1989. (New Haven and London: Yale University Press, 1989), fig. 218.